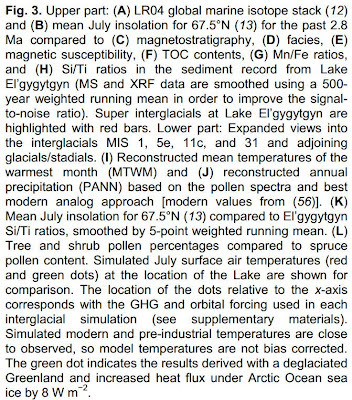 A new paper published in Science examined sediment records from the Russian Arctic and finds at least 8 "super interglacials" [each lasting several thousand years] with "extreme warm conditions" up to 5C warmer than the present occurred over the past 2.8 million years. Furthermore, the paper states, "Climate [model] simulations show these extreme warm conditions are difficult to explain with greenhouse gas [CO2] and astronomical forcing [solar insolation] alone." 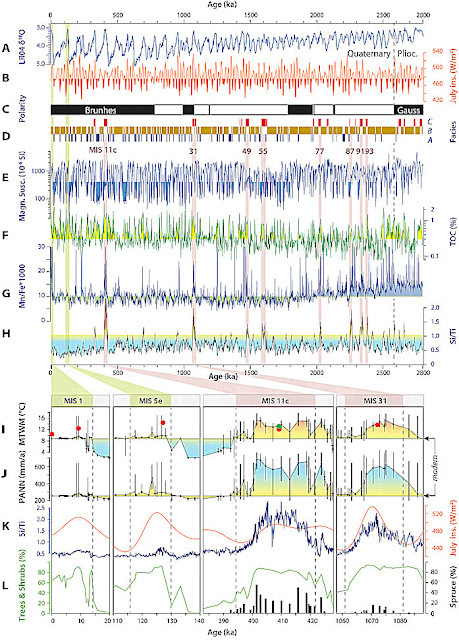 The paper also finds the Arctic warming occurred simultaneously with Antarctic warming, indicating an interconnected, global phenomenon. 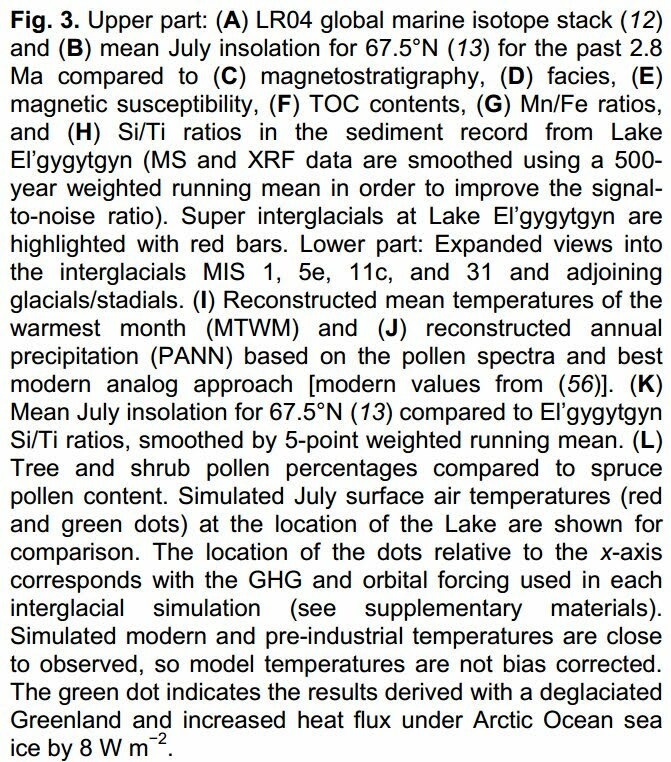 Implications of the paper include: 1) The globe has been much warmer without human influence during multiple periods over the past 2.8 million years, 2) IPCC climate models are incapable of reproducing past temps and therefore unable to project future temps, and 3) global warming far exceeding alarmist IPCC projections has occurred several times in the past without triggering any "tipping points." 1Institute of Geology and Mineralogy, University of Cologne, Zuelpicher Str. 49a, D-50674 Cologne, Germany. 2Department of Geosciences, University of Massachusetts, 611 North Pleasant Street, Amherst, MA 01003, USA. 3Far East Branch Russian Academy of Sciences, North-East Interdisciplinary Scientific Research Institute, 16 Portovaya St., 685000, Magadan, Russia. 4Helmholtz Centre Potsdam, GFZ German Research Centre for Geosciences, Telegrafenberg C321, D-14473 Potsdam, Germany. 5Earth & Space Sciences, University of Washington, Box 351310, Seattle, WA 98195–1310, USA. 6Climate Impacts Research Centre, Umeå University, SE-981 07 Abisko, Sweden. 7Institute of Geological Sciences, Free University Berlin, Malteserstr. 74-100, Haus D, D-12249 Berlin, Germany. ↵† Present address: Department of Physical and Earth Sciences, Worcester State University, Worcester, MA 01602, USA. ↵‡ Present address: Department of Geology, Lund University, Sölvegatan 12, S-223 62, Lund, Sweden. The reliability of Arctic climate predictions is currently hampered by insufficient knowledge of natural climate variability in the past. A sediment core from Lake El’gygytgyn (NE Russia) provides a continuous high-resolution record from the Arctic spanning the past 2.8 Ma. 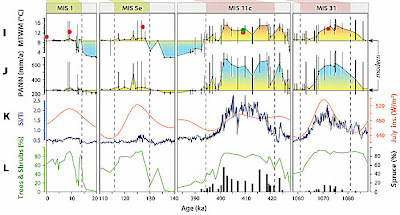 The core reveals numerous “super interglacials” during the Quaternary, with maximum summer temperatures and annual precipitation during marine benthic isotope stages (MIS) 11c and 31 ~4-5°C and ~300 mm higher than those of MIS 1 and 5e. Climate simulations show these extreme warm conditions are difficult to explain with greenhouse gas and astronomical forcing alone, implying the importance of amplifying feedbacks and far field influences. 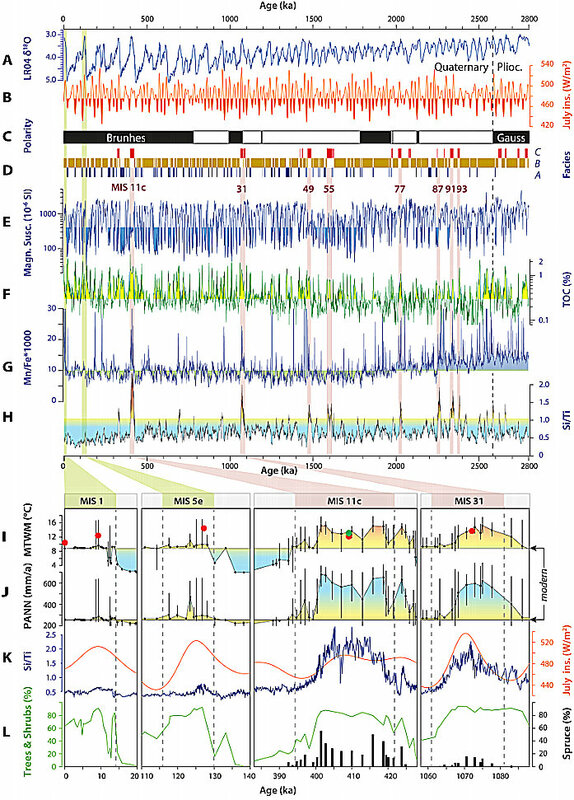 The timing of Arctic warming relative to West Antarctic Ice Sheet retreats implies strong interhemispheric climate connectivity. Graph I shows a blowup of the temperature reconstruction with temps up to 6C higher than modern. 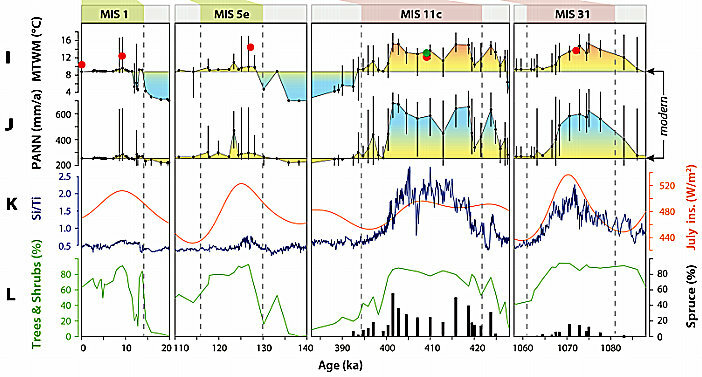 The 8 pink vertical lines indicate "super interglacials" over the 2.8 million year record.